We've been holding classical music house concerts at our house with an organization called Groupmuse.com which matches up musicians who want to perform with music fans that want to hold house concerts. On September 18 last year Anne Rainwater played Bach's Goldberg Variations for an appreciative audience of 27 music lovers. 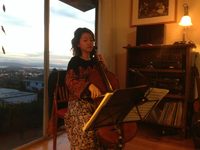 In May, Mosa Tay played Bach Cello Suites.